Botifarra is a trick-taking game for four players in partnerships. Unlike many trick-taking games, Botifarra includes a number of rules restricting which cards can be played when. As a result, players are able to deduce information about what their opponents may hold. The game originates from the disputed region of Catalonia (currently a province in the northeast corner of Spain, but which declared its independence in October 2017). The game is popular enough that organized duplicate-style tournaments are played there. In Catalonia, Botifarra is traditionally played counter-clockwise (all action proceeding to the right). The description below is written to follow the clockwise fashion most card games follow. If you wish to play it the traditional way, just reverse the directions. The object of Botifarra is to be the first partnership to reach 101 or more points. Points are scored by collecting face cards, aces and 9s in tricks. Botifarra is typically played with a 48-card Spanish deck. 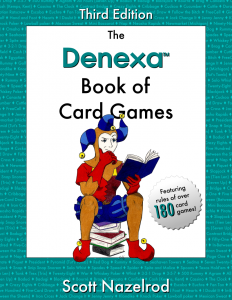 To make an equivalent deck from the 52-card English deck, like a deck of Denexa 100% Plastic Playing Cards, just remove the 10s. You also need something to keep score with, such as paper and pencil. Determine partnerships by whatever method is convenient, either randomly or by mutual agreement. (Players often choose to play three games per session, so that each player may play one game partnered with each of the other players.) As is typical, players should be seated across from their partner. This ensures that the turn of play alternates between partnerships as it proceeds around the table. Shuffle and deal twelve cards to each player (dealing out the entire pack). In Botifarra, the highest card is the 9. All other cards rank in their usual order. The full rank of cards, therefore, is (high) 9, A, K, Q, J, 8, 7, 6, 5, 4, 3, 2 (low). After a trump suit has been chosen, the dealer’s opponents may choose to double, thereby doubling the points scored by the winner of the hand. If the hand is doubled, the dealer’s partnership may redouble, multiplying the value of the hand by four. The opponents can then reredouble, increasing the multiplier to eight. (This is the highest multiplier possible.) Players get the opportunity to speak in turn order from the last player to make a declaration. The player to the dealer’s left leads any card they wish to the first trick. Each player in turn then plays one card to the trick. Once all four players have played a card, the highest trump played, or the highest card of the suit led if no trump was played, wins the trick. Once a player wins a trick, they place it face-down in a shared won-tricks pile located in front of either them or their partner. Tricks should be kept distinct from one another somehow, such as by putting them at right angles to the previous trick. Whichever player won the trick leads to the next one. Game play continues until one partnership exceeds 101 points. That partnership is the winner. Tute is a trick-taking game most often played with four players in partnerships. Originating in Italy as Tutti (meaning all), it spread to Spain, where it became one of the country’s most popular games. In Tute, only aces, 3s, and face cards matter—none of the lower cards carry any sort of point value! The object of Tute is to score the highest number of points in cards taken in tricks. Players may also score points by holding K-Q combinations and by taking the last trick. Tute is played with the Spanish 40-card deck. To form such a deck from a standard 52-card deck like Denexa 100% Plastic Playing Cards, simply remove the 8s, 9s, and 10s. You’ll be left with a 40-card deck with aces, face cards, and 7s through 2s in each of the four suits. (In the Spanish deck, the face cards are King, Knight and Knave; these are functionally equivalent to the English deck’s king, queen, and jack.) It may also be helpful for having something to compute scores—a calculator or pencil-and-paper will do. Determine partnerships by whatever method is preferred—either some way of determining it randomly, or through plain mutual agreement. Players should sit across from their partner, so that as the turn of play proceeds around the table, players alternate in taking turns. In Tute, the cards rank in their usual order, with aces high, with one exception. The 3 is elevated to rank just below the ace. That means that the full rank of cards is (high) A, 3, K, Q, J, 7, 6, 5, 4, 2 (low). All of the face cards, aces, and 3s also carry a point value. Aces are worth eleven points, 3s are worth ten points, kings four, queens three, and jacks two. The number cards other than 3s are worth nothing in terms of points. Tute is played counter-clockwise, so the player to the dealer’s right leads to the first trick. Continuing around to the right, each player in turn plays a card to the trick. Players must always follow suit, if possible. Additionally, they must head the trick if they can. That means that if the player can follow suit, they must; if they can’t follow suit and they can trump, they must do so (and overtrump if possible). Only if a player has no cards of the suit led or the trump suit can they play a card from one of the other two suits. After all four players have contributed a card, the player who played the highest trump, or the highest card of the suit led if no trump was played, wins the trick. That player collects all four cards and places them into a won-tricks pile in front of them called a baza. (Each player shares a baza with their partner.) The individual player that won the first trick then leads to the second one. After a player wins a trick, but before leading to the next one, they may make a declaration for any marriages they hold. The two possible declarations are las cuarenta (the 40) for holding the king and queen of trumps, and las veinte (the 20) for holding the king and queen of any other suit. When making a declaration, the player must reveal the two cards. If a player has multiple such combinations, they may only declare them one at a time (they must declare any additional marriages after winning a later trick). If a player holds las cuarenta, it must be the first declaration made; once las veinte has been declared, las cuarenta may no longer be declared. Of course, upon declaring las veinte, if the player holds any additional veintes they can still be declared on later tricks. Holding all four kings is a special combination called a tute. If a player holds a tute, they may declare it as usual after winning a trick. Making such a declaration instantly wins the hand for the player holding the kings. Whichever partnership has the higher total score wins the hand. If a longer game is desired, play a pre-determined number of hands. Whichever team wins the majority of the hands wins the overall game. Mus is a betting game for four players in partnerships. Players draw and discard until they reach a hand they’re happy with, and then the betting begins. But there’s not just one “best” hand—there’s four rounds of betting, each with wildly different criteria for how the best hand is determined, and one hand can’t be the best in all four categories! Mus most likely originated in the Basque country, a region spanning the border between France and Spain. From there, the game spread throughout both of those countries. From Spain, Mus was carried to other Spanish-speaking countries throughout the world. The object of Mus is to be the first partnership to reach a score of 40 points. This is done by, through drawing, forming hands that compete well in a number of different categories. Mus is traditionally played with a Spanish deck of 40 cards. To recreate such a deck from an English-style 52-card deck like Denexa 100% Plastic Playing Cards, remove all the 8s, 9s, and 10s. This will leave you with a 40-card deck consisting of face cards, 7s–2s, and aces in each of the four suits. To keep score, you will need 22 counters of some kind, such as stones, beads, beans, marbles, or poker chips. These counters are kept in a pool in the center of the table. Uniquely, the value of each counter differs depending on who holds it! When a point is scored, one of the partners designated to do so draws a counter from the central pool. Upon reaching a score of five, this player returns four counters to the pool and passes the fifth to their partner. Thus, each counter this second player holds represents five points. When the second player has seven counters (representing a score of 35), they declare this and return them to the pool, putting their opponents on notice that they only need to score five more points to win. Mus is traditionally played with a series of signals that players can use to indicate their holdings to their partner. These signals are the same for both teams. Part of the skill of the game is to figure out how to pass the signals to your partner without the opponents intercepting them. Which signals mean what, and what signals are allowed, should be discussed prior to game play. As is usual with partnership games, partners should be seated across from one another, with an opponent on either side. The turn should alternate between partnerships as it passes around the table. Shuffle and deal four cards to each player. The remainder of the deck becomes the stock. Mus is most widely played “with eight aces and eight kings”. To achieve this, the 3s are considered equivalent to kings, and the 2s are considered equal to aces. They are treated exactly the same as if they were the same rank (to the point that K-3 is considered a pair). Cards otherwise rank in their usual order, with aces low. Unlike in most games, game play is always conducted to the right. The player to the dealer’s right goes first. They examine their hand and determine if they would like to exchange some of their cards for new ones for the stock. If they do, they say “mus”. The next player to the right must then make the same determination, and so on. If all four players agree to a mus, then they discard one to four cards, face down, and the dealer gives them replacements from the stock. Then, another round of declaring “mus” or “no mus” takes place. (If the stock is depleted, shuffle the discards to form a new stock.) This continues until a player calls “no mus”. The game then proceeds to the betting rounds. See: agree to the bid, the amount of which will be won by whoever has the best cards for the category bid on. Raise: accept the opening bid and propose an increased bet. Fold. decline the proposed opening bid. The side that didn’t fold immediately collects the previously-accepted bid amount, regardless of who actually has the better cards. If all players fold to an opening bid, the “previously accepted” bid is only one counter. If all four players pass with no opening bid being made, the round is contested with a stake of one counter going to the partnership with better cards. There is one additional, special bid called órdago. If your opponent accepts a bid of órdago, the entire game is decided by the outcome of the current round of betting. The hands are immediately revealed, and whoever has the best cards for that round wins the entire game. It is important to note that all bids are for the partnership, not the players. You may well have an awful hand, but find yourself betting a high number of counters because you know, either through previous bidding or signals, that your partner is a lock to win the round. After each round of betting, the players proceed to the next one. The hands are kept concealed until all four rounds are concluded (except when a bid of órdago is accepted). Grande: Betting on who has the highest hand. Hands are compared by their highest card. If there is a tie, the second-highest is used to break it, then the third-highest, and finally the lowest. Chica: Betting on who has the lowest hand. Hands are compared the same as in Grande, but comparing by the lowest card, then second-lowest, etc. Duples: Two pair, like K-3-4-4 or 7-7-2-2. Duples are compared by their higher pair, then their lower one. Three-counter bonus. Medias: Three of a kind, with one unmatched card, like 5-5-5-Q or A-A-2-6. The rank of the three-of-a-kind is compared first, then the kicker. Two-counter bonus. Par simple: One pair, like K-3-7-A or J-J-6-4. The rank of the pair is compared first, then the higher kicker, then the lower kicker. One-counter bonus. Juego: Each player totals the value of their hand, with aces (including 2s) worth one, face cards (including 3s) worth ten, and all other cards worth their face value. Before betting, players declare, in turn, yes or no as to whether they have a hand worth 31 or more points. If at least one does, the hands will be compared for best juego. A hand value of 31 is the best, and entitles its holder to a 3-counter bonus if it wins. Second is a value of 32, then 40, and then in descending order down to 33 (all of which are worth a 2-counter bonus if it wins). Punto: Only if nobody holds a juego is the Punto round played. This is simply betting on the highest hand value (30 being best, since 31 and above would be a juego, and 4 being worst). The holder of the best hand scores a one-counter bonus on top of the agreed-upon bet. In any case, if two hands are exactly identical, whoever comes first in turn order wins. After all four rounds of betting take place, the hands are revealed and compared. Payouts on rounds where betting actually occurred (or all four players passed) are done in exactly the same order as the betting rounds (Grande, Chica, Pares, Juego/punto). If a partnership reaches a score of 40, stop immediately—they win the game, even if one of the other rounds would have allowed their opponents to surpass them. If nobody has a score of 40 after all four rounds have been scored, the deal passes to the right and another hand is played. Truc is a trick-taking game played throughout Spain and southern France. It is played by four players in partnerships. Unlike most trick-taking games, Truc doesn’t require you to follow the suit of the card led. Hands of Truc can be very short, because they are only played out until a majority of the three tricks have been decided. A hand of Truc can also be abruptly stopped by one team rejecting a proposed raise by their opponents. Truc is descended from Put, a game played in England as far back as 1674. Truc, in turn, was exported to South America, where it evolved into Truco. The object of Truc is to be the first partnership to score twelve points by taking at least two of the three tricks in each hand. Truc is traditionally played with a Spanish 40-card deck. 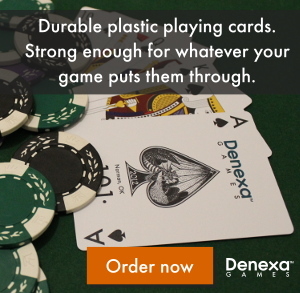 To make an equivalent deck out of a standard 52-card deck of Denexa 100% Plastic Playing Cards, remove the 8s, 9s, and 10s, leaving a deck of aces, face cards, and 7s through 2s in each of the four suits. You also need some way of keeping score, such as pencil and paper. Determine partnerships by any method that is agreed upon, such as a random method like high-card draw or simply mutual agreement. Players sit opposite one another. Prior to the first hand, each partnership may retreat to a location where the other team will not overhear them and devise a system of signals to use throughout the game. These signals can communicate anything that the players desire, including the overall strength of their hand, the cards they hold, what they want their partner to play, and so on. Partners can also communicate verbally throughout the hand. Nothing’s off limits! The dealer shuffles and offers the deck to the player to their left to cut. They may do so, or simply tap the pack, declining to cut. If the deck is cut, deal three cards to each player. If the cut was refused, the dealer has the option to deal only one card to each player (making for a much shorter hand). Truc uses a special card ranking unique to the game. 3s, 2s, and aces are the highest-ranking cards in the game, and the rest of the cards rank in their usual order. Therefore, the full rank of cards is (high) 3, 2, A, K, Q, J, 7, 6, 5, 4 (low). Game play starts with the player on the right of the dealer, and thereafter continues to the right. This player leads to the first trick. Each player in turn plays a card to the trick. A player may play any card to a trick; there is no requirement to follow suit. The person playing the highest card wins the trick. If two players on opposite teams tie for high card, the trick is a draw. The individual player that won the trick leads to the next one. If nobody won the trick, the player who led to that trick leads to the next one. A hand only continues until the majority of tricks in it have been determined. If the first two tricks are won by the same partnership, there is no need to play the third one. The partnership that wins the majority of the tricks wins the hand. If there is a tie, due to one or more tricks not being won by either player, the dealer’s opponents win the hand. Whichever team wins the hand scores one point. The deal passes to the right, with any unplayed cards shuffled into the deck unexposed. At any time during their turn, either before or after playing a card, a player may raise the stakes for the hand to two points by calling “truc”. The next player in turn may either accept the raise by playing a card (or making a verbal declaration of “accept”, “OK”, or the like) or reject it by placing their cards face down on the table (or saying “No” or similar). Once a truc has been accepted, it may be re-raised by calling “retruc”, proposing a raise to three points. As before, the next player to their right then has the option to accept or reject the retruc. Only an opponent of the first raiser may re-raise. A retruc may be called either on the same trick as the original truc, or a later trick. If a raise is accepted, the winners of the hand score the amount of points agreed to as a result of the raise. If a raise is rejected, play of the hand stops immediately. The partnership that proposed the most recent raise scores whatever the last agreed-upon amount for the hand was. Because a partnership with a score of eleven is only one point away from winning the game, special rules apply when either partnership has scored eleven points. A full three-card hand must be dealt; a player cannot give the dealer the option to deal only one card. If only one partnership has a score of eleven, that partnership looks at their cards and decides whether or not to play. If they do, the hand is played for three points. In the event that both partnerships are tied at eleven, the hand is played as usual, with the winner of the hand winning the entire game. The first partnership to score twelve or more points is the winner.